It's time for the new SunVox Song Competition! any modules, any genre, any length, any number of works. 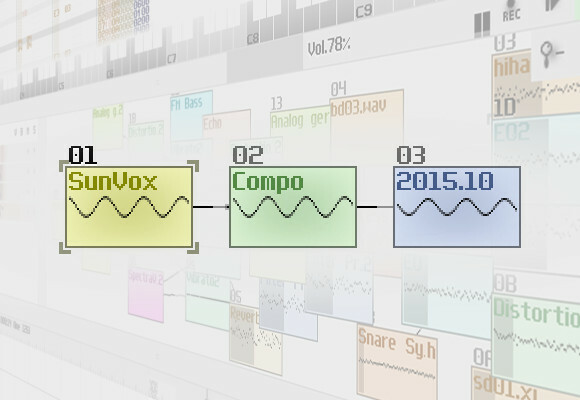 Send your ZIP-packed .sunvox file(s) to nightradio@gmail.com with "SunVox Compo" topic. Winners will be announced later (after the public vote) on warmplace.ru and on all SunVox-related blogs. The best ones will be included to SunVox distribution. iOS promocodes (for any of my apps) will be provided for the first three winners. Okay lets go and compose! Is it permissible to use example instruments, or instruments from songs included with SunVox? Can we enter projects that were started before the compo was announced? Can we use chance elements? Can we enter a project of indeterminate length? Yes, but it must be unpublished. I will try to enter this! I have one request, that is, could we have more explicit voting rules this time? (e.g. you're not allowed to vote on your own song). Last time it was ambiguous, and people who chose not to rate themselves 5/5 were at a disadvantage. Anyway, really looking forward to hearing what everyone comes up with! No problem. But how can we make it technically? :) Some ideas? Maybe just add instructions that everyone SHOULD vote 5/5 for their own submission, that way it's certain. And if they don't read the instructions and rate their own song, then it's their own fault. So as long as the Zip file is not greater than 64 kb it is okay if the SunVox file itself is larger? Yes, the ZIP must be smaller than 64 KB. zip archive > 64KB => not OK. Sounds as if your zip archive will be small enough. Submit!